There are so many summer related sewing projects that I thought I would share a few that I have made or have on my radar to make, plus I wanted to share an exciting announcement. My in-laws have a home on a lake, so during the summer we tend to visit a lot. Which makes summer sewing on my mind. 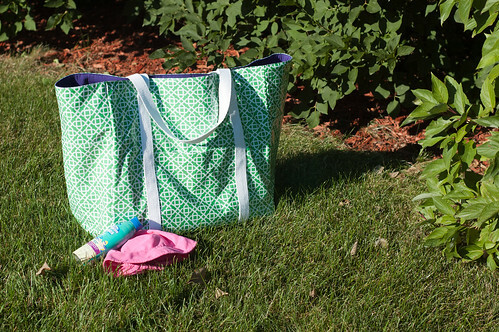 Last year, I made this beach bag using Sis Boom laminated cotton. You can read more about the bag, as well as sewing with laminated cotton here. I still have plans to make this into a pattern, but am not sure when I will finish. I made a similar swimsuit towel cover up using this tutorial by Prudent Baby. I will blog about it in the future…once I get pictures of the finished product. So far, Lillian doesn’t really want to wear it that often, but I’m hoping that at the lake that will change. I think that this quilt by Melanie Dramatic would make a super cute picnic quilt. It looks pretty easy, even for a beginner quilter. With it being made from layer cakes you could easily make it any size that you want. This casserole carrier by 2 little hooligans would be a cute way to bring all of your casseroles to those summer get togethers. Be sure to check out shorts on the line, which is a summer sewalong starting July 1st in which imagine gnats, Designs by Sessa, and small + friendly will post pattern reviews and tutorials for shorts. At the end, they will do roundup posts featuring reader’s shorts, so be sure to link up along the way. There are some great sponsors so it will be exciting to see what the giveaways consist of. Also, be sure to check it out the first week of July as I will be guest posting! What summer sewing is on your list? Thanks for including me. 🙂 It is easy!!! In fact, my daughter (who is not quite 8) is now making one! She is making her’s 5 squares x 5 squares and only has one row left to do. I’ve not sewn a single bit – she’s doing it all! I’m confident that anyone could do this – just be mindful to make your seams the same size so that they line up!!! Thanks for sharing the layer cake quilt. I’ve been so intimidated by quilting, and this looks like something I could do as a true beginner!